From curriculum innovation to internationalisation this conference aimed to disseminate best practice and allow for knowledge exchange on important key themes, relevant to teaching and learning provision within the university sector. The conference saw the launch of the SHINE website, a unique project and e-resource for student wellbeing which meets many different student needs and is available to all Plymouth University students. The SHINE team were on hand to demonstrate the website and give participants the opportunity to explore the resource. 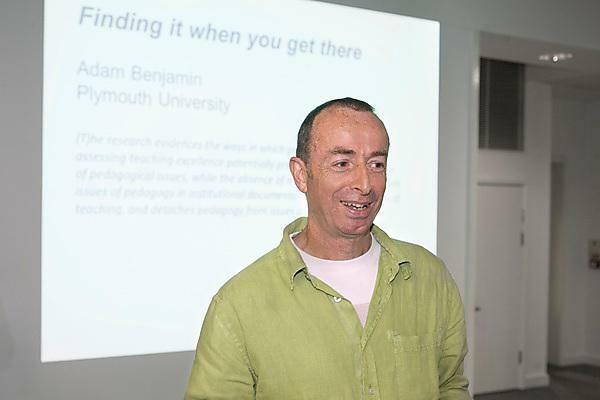 The Pedagogic Practice of Improvisation - will we find it when we get there? "Pedagogy traditionally attempts to control and to grasp the knowable, leaving no space open for what is really uncontrollable and unknowable in education; and it attempts to do so out of desire for self-affirmation, desire for sameness and repetition." Kumashiro 2010:46. The title references the uncertainties that characterise my pedagogic practice of improvisation: a commitment to un-scored work, and a willingness to leave space for the unknown and the unexpected. In 10 Rules for students and teachers (often misattributed to John Cage) Sister Mary Corita refers to this as “leaving plenty of room for 'x'; meaning that there are always going to be unexpected elements within our research that come into play only if we allow time and space for them to arise, the implication being that those of us in the arts, and perhaps elsewhere, should avoid being overly prescriptive about what our outcomes might be or, and in the case of dance, too conscriptive about what kind of body might qualify for training. In the context of fee paying students, and in disciplines within and beyond the Arts, Adam wonders where and how might we assure the place and value of ‘x’ within our programmes? Higher education is conservative by nature, and radical movements, and Adam would include integrated dance in this category, are subject to fierce interrogation and pressure to conform to industry standards. It is his hope that the fledgling integrated dance initiatives within higher education can help us resist the desire for ‘sameness and repetition’ and that universities are courageous enough to allow students, researchers and artists the freedom and importantly, the time to find it when they get there. Using examples from his own practice and research this keynote explored the value of not knowing, and how suspending the need to have a ready answer, may in the long term be a more useful attribute than the pressure to come up with the right one. Key words include: Improvisation, dance, consciousness, other, disability, higher education, training, embodied pedagogy. Adam trained at Middlesex University. He was joint founder and artistic director of CandoCo Dance Company (1990-98) winning a London TimeOut Performance Award for Flying in the Face of... The company also collected the Sainsbury Award for Education and the Prudential Award during this period. He was artistic director of Tshwaragano Dance Company in South Africa, and has choreographed for Remix Dance Project (Cape Town). Adam was an associate Artist at The Place, he is a Wingate Scholar and was awarded one of the first Rayne Fellowships for Choreography in 2006. In 2013 he was awarded a National Teaching Fellowship. Ian’s first degree was in applied biology before progressing onto gaining his PhD in avian ecology and physiology from Durham University. Ian started teaching at Suffolk College, where he taught physiology, before moving on to lecture in ecology at De Montfort University. Research interests in aspects of pedagogy and work-based learning led to a position at City University in a health focused education development unit. Ian then moved on to become head of education development at the University of Worcester, before moving on Oxford Brookes where he is associate dean for student experience in the Faculty of Health and Life Sciences. Ian is particularly interested in mentorship, and learning in non-formal environments. He has written three textbooks and numerous peer reviewed articles. He is a national teaching fellow and a member of the Committee of National Teaching Fellows, he is also a principal fellow of the Higher Education Academy. View his profile page at Oxford Brookes for further information.